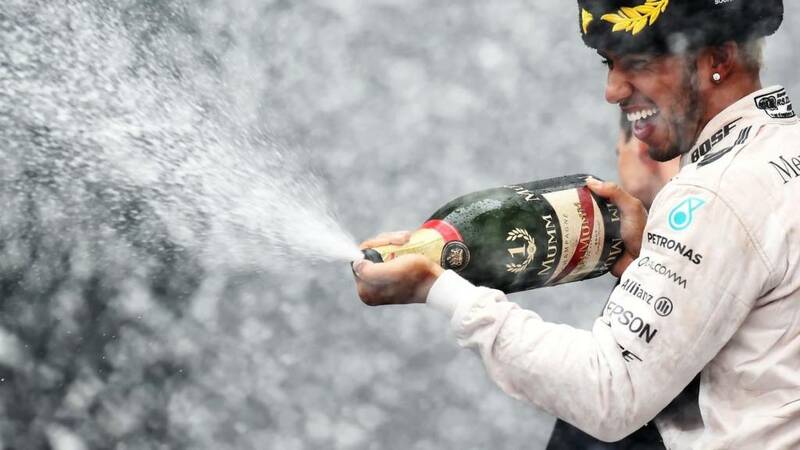 The title is almost in Lewis Hamilton's grasp after taking victory in Russia, while Nico Rosberg retired. Hamilton needs nine more points than Sebastian Vettel and two more than Rosberg at the next race in the USA to clinch the title. Will he do it? Join us in two weeks to find out. Almost time for us to wrap things up here after a thrilling Russian Grand Prix. Missed it? Then race highlights will be on BBC Three at 19:00 BST. You can also read all about it in Andrew Benson's report here. The constructors' title celebrations can begin. Next up, the drivers' title. After today's dominant win, it is surely a matter of when, not if, Lewis Hamilton will wrap that one up. History repeats then as Mercedes secure back-to-back constructors' titles, with this one coming at the same race they won the 2014 title. "Raikkonen penalised 30 seconds for Bottas crash - Mercedes are constructors' champions. "Also a five-second penalty for Alonso for exceeding track limits, demoting him to 11th behind Verstappen." That means Kimi Raikkonen is demoted to eighth so by our calculations...Mercedes have won the constructors' title. And just as we say that, Kimi Raikkonen has 30 seconds added to his race time for causing a collision. The late collision between Kimi Raikkonen and Valtteri Bottas is under investigation. We haven't heard anything yet, but we are keeping our eye out. A mixed day for Williams. Valtteri Bottas crashed late on, but Felipe Massa produced a great drive to finish fourth. McLaren finished inside the top 10, with Jenson Button ninth and Fernando Alonso 10th. Don't think we expected a double points finish. We did everything right, that's all we can do. "I totally see Lewis Hamilton as the modern-era great. He is the class of the field right now. Yes, he's in the best car in the field right now but he has engineered that." Mike Mawby: Everyone says what a good F1 ambassador Jenson Button is but you know what Lewis Hamilton is pretty damn good too. Joanna Poole: Middle teams seem to do extremely well with only one car racing: Perez third today, Grosjean third Belgium, Verstappen fourth Hungary. A hat trick for Hamilton? After wearing a Russian cossack following today's race, Lewis Hamilton has hats on his mind. He told the F1 Forum: "I'm aiming for the Mexico one - the sombrero. My aim is to get on the podium there and get one of them." "I will take my time and work just as hard as I have done," he said. Only Michael Schumacher and Alain Prost now have more F1 wins than him, but he says he is only focused on the title. "The goal is still the third world title. Until I achieve that then there is no other goal." Lewis Hamilton has told the F1 Forum he was hoping to race "like in Bahrain last year" with Mercedes' team-mate Nico Rosberg before the German's early retirement. He said: "I had a really good getaway and I tried for the slipstream. I got slightly ahead but not enough and I backed off." Is the world championship done and dusted? "I never get to the point where I think it's done and dusted. The goal is still to make sure I have it when I cross the line in Abu Dhabi." Suzi Perry and co. have caught up with race winner Lewis Hamilton for a word, watch it on the F1 Forum. *WARNING* Interview comes with horrendous music from the Red Bull garage in the background. Sergio Perez is happy, and so is Lewis Hamilton. "I was so hard on myself. I lost position on corner 13, but by corner 15 I said 'Checo, there is nothing more you could have done'. "When Valtteri came alongside me, there was nothing I could do. We had very little rubber left. The last five laps it was just about managing the braking and not flat-spotting them. "This team, the people we have and level of engineering is pretty high and I am very proud of them. "People seem to forget we only had two days of testing before the season started." Quote Message: Sergio Perez showed he is a quality driver. He did everything that was asked of him. There was a bit of luck in the end but that is F1 and he deserved his podium. Sergio Perez showed he is a quality driver. He did everything that was asked of him. There was a bit of luck in the end but that is F1 and he deserved his podium. "It's a bit lucky for us that the two Finns came together. It was going to be marginal with the tyres at the end. "We pitted earlier because we thought it would take longer to fix the barrier (after Romain Grosjean's crash) than it actually did. "There will definitely be a bonus payment for Sergio. Hopefully having him on the podium will be a boost before America and Mexico." A first podium for Force India since last year's Bahrain Grand Prix, and a third in total. They probably won't get a more dramatic one than today's as well, Sergio Perez snatching it from the jaws of defeat courtesy of the late collision between Kimi Raikkonen and Valtteri Bottas. Carlos Sainz almost completed the perfect day having come out of a massive crash in practice on Saturday unscathed, got back in his Toro Rosso and got up to seventh from the back of the grid before a problem late on ended his race. He also ended up making contact with the barrier at Turn 13, where he crashed yesterday, and he said: "We could have had P6. We had great pace. With eight laps to go I crashed again. The barrier at Turn 13 and I are going to become friends I think." Sebastian Vettel is up to second in the drivers' championship after finishing second today, and while a title challenge has probably come too late this season, he is hoping for an even closer battle next season. "I hope so," he said when asked if they can challenge for the title in 2016. "That is our target, we want to be a bit better in the race and make sure we give Mercedes a really good challenge." Quote Message: What was interesting was this was a better race for the fact the tyres weren't degrading and the drivers were able to push. What was interesting was this was a better race for the fact the tyres weren't degrading and the drivers were able to push. Claire Scrivens: what a Finnish!!!! Gutted for valtteri such a shame for both the Finns. Great race though. John Mulholland: It was Kimi's fault but he's a racer and decided to have a go. Made it an exciting end. Keith Benjafield: I hope the FIA throw the book at Kimi. He ruined a great drive by Bottas. What an idiot!! Spoiled the race for us Williams fans. "I got past Perez and approaching Turn Four someone hit me from behind. It's really disappointing because it's ruined my day." Does he expect a penalty for Raikkonen? "I would guess so but I would have to see the video. "It feels pretty bad when it ends up like this. All the hard work doesn't matter when you end up with zero points." Coverage on BBC One has finished but there's still plenty going with the Forum on BBC Red Button and at the top of the page right now, or via the live coverage tab for followers on mobiles. "If Raikkonen is penalised for the Bottas crash and demoted to eighth or lower, Mercedes are constructors' champions." "Raikkonen seemed to come from a long way behind. When they started braking, he wasn't anywhere near him." Could there be a penalty for Raikkonen? "Possibly, if the stewards feel he caused the accident." "I think Sergio Perez will be sending a bottle of tequila Kimi's way." "I passed him (Bottas) once before in the same place and thought I would try the pass and once I decide to go I can't do anything if he doesn't see me. "We collided and it's a shame. I tried to pass in the normal way but it ended in contact." Nico Rosberg's retirement and second for Sebastian Vettel means Mercedes will have to wait a little longer for the constructors' title. Lewis Hamilton is marching towards a third world title, helped by Nico Rosberg's retirement today. Third-placed Sergio Perez in the podium interviews: "It's just feels great to be back. One lap before the end it seemed like everything went away from us. I was very unhappy with myself but in the end I thought ''I gave it all". I did plenty of laps with my tyres and had massive degradation. On the last lap when it came it was just amazing." Sebastian Vettel, who finished second: "I think it was a very good race. The car was fantastic and kept getting better. I thought there was a slight chance to catch Lewis at one point but he had so much pace in hand." Sergio Perez is enjoying this one. He secures only Force India's third podium in F1. Race winner Lewis Hamilton in the podium interviews: "I was excited because Nico and I were quite close together at the beginning. It was a shame for the team to lose one of the cars. "I don't take what we have granted. It's a special moment for me to surpass Ayrton (42 wins)." Great result for McLaren today as well as they got both drivers in the points. Oh he has got one now. Good stuff. Andrew Kasper: The Iceman well and truly lost his cool there! Feel sorry for Bottas. Great result for Checo and Force India though. Liam Cutler: Hamilton is having the time of his life though. Pretty simple race, but he is truly relishing every single drive. Rob Spedding: Gutted for Valtteri Bottas - top drive, great overtake on Perez and deserved to be on the podium. Ashan De Silva: Raikkonen you idiot, totally his fault, great drive by Perez!! "Where's my hat?" wonders Seb. Hamilton is then off to shake hands with Russia president Vladimir Putin before grabbing a traditional Russian hat on his way to the podium. The frustration clear to hear over the radio from Valtteri Bottas: "What the BEEP did he do?" Force India's Sergio Perez after finishing third: "Whooo, great job guys. I had no rubber left at all." "It was a desperate last lunge from too far back. Kimi is usually quite honest and I think he will accept responsibility for that." Marc: Stupid move by Kimi. Peter Owen: Chaos in Russia! Drama at the last as Valtteri Bottas spies a chance to pick off Sergio Perez and he takes it. Bottas is into third, with Kimi Raikkonen also getting the better of Perez. But what is this!? Contact between Bottas and Raikkonen and they are out of the battle for third! Perez back in third! Alex: Aww shame for Sainz, brake failure and off he goes, and broken rear wing too, not a great weekend sadly for him. Rob Marshall: Moderately interesting Russian GP but what a dull place Sochi is - looks like an abandoned theme park. Lewis Hamilton reports a rear wing problem but it isn't going to cause him any trouble with one lap to go. He leads Sebastian Vettel by 7.8s. Engineer: "OK Lewis, three laps to go, still seeing some suspect performance from the rear wing. We suggest if you get DRS, not to use it." A real shame for Carlos Sainz after showing some real determination this weekend. A hair raising crash in practice yesterday resulted in him being airlifted to hospital. It was simply an outstanding achievement for him to be even racing today but even then he got himself up from the back of the grid and into the points. Even when there was a problem with his car he would not give up. An absolute battler. Daniel Ricciardo is also out as he parks his Red Bull. He reports a problem with his suspension. My word! Replays show a marshal running on to the track to retrieve that bit of debris that came off the Toro Rosso. Just as he sprints back to the barrier Sebastian Vettel comes by. That was uncomfortably close. "We have a very brave Russian," Vettel says over team radio. That's Carlos Sainz's race over. He has parked the Toro Rosso. A great effort, though, to have got into the points initially after yesterday. James, you spoke too soon. Carlos Sainz spins once, gets going, and then spins again at Turn 13, planting his rear into the same barrier he crashed into yesterday, he gets himself going again but a piece of debris comes off his rear wing. Engineer to Valtteri Bottas (currently fourth): "Ten laps to go, Perez is starting to struggle badly. We can still get this podium." Sebastian Vettel clocks the fastest lap of the race and he is taking a nibble out of Lewis Hamilton's advantage, which currently stands at 11.8s. Lukas Redl: Force India on a podium today? That would be fantastic. Gareth: Force India on the podium? Bring it on! Sean Harrison: Alonso's radio messages are getting as good as Raikkonen's. "There is a real opportunity for someone different to get on the podium today. The question is 'who is it going to be?'" Daniel Ricciardo is very much in with a chance to claiming a place on the podium. He is two seconds behind Sergio Perez in third. "Checo, it's P3 but to make it work, we need maximum management on the front," he is told over team radio. "I can't do any more," is the reply. Can Perez keep Ricciardo at bay before the flag? Lewis Hamilton may be storming towards victory out in front - he has a 12 second lead over Sebastian Vettel - but there are some good battles further down the field. Felipe Massa versus Daniil Kvyat is one of them, a lapped Manor wants no part of it as it runs wide to let the two duel. Massa attempts to get past Kvyat, but the Russian holds him off. "Great Finn on Finn action there. This is great to see Raikkonen back and so racey. He saw the opportunity - he hasn't made it stick because Bottas had great reactions to do the cut-back." Plenty of excitement in the Williams garage as they watched that thrilling battle between Valtteri Bottas and Kimi Raikkonen unfold. Some more great wheel-to-wheel action involving Kimi Raikkonen! The Finn fancies a crack at his compatriot Valtteri Bottas and swoops in at Turn 4, briefly taking the position only for Bottas to immediately fight back. Raikkonen tries again but Bottas fends him off to retain fifth. Daniil Kvyat returned to the circuit in ninth, just ahead of Jenson Button. Meanwhile, Felipe Nasr pits from second, takes on softs and is out in 12th, behind the McLaren of Fernando Alonso. "Tomorrow morning it's going to be a little bit sore but I can be very happy with the safety in F1. Here I am. I feel sorry for the guys because there is going to be a lot of work on the car. "We need to understand what happened. You do realise quite early that you can't do anything any more so you leave the steering wheel and get muscles as strong as you can. I was glad when I opened my eyes [and] I was fine. "I am very thankful we have made some progress with technology." Daniil Kvyat makes his first stop soon after, leaving Felipe Nasr, currently second, out there as the only driver yet to make a stop. Sean Harrison: Bad luck for Rosberg but Hamilton had more of it last year and still won the title. Alex Meek: Talking about fair? How many retirements did Hamilton have last year in comparison and still won the championship? Just karma. Lewis Hamilton pits with a huge advantage at the front. It is a relatively leisurely stop with no real pressure on the Mercedes. He takes on softs before emerging back in P1 with a 7.4s advantage over Daniil Kvyat, who has yet to make his first stop with 33 laps gone. In comes Sebastian Vettel and he is back out ahead of Valtteri Bottas, into P6. Kimi Raikkonen is next in, can he also get back out ahead of Bottas? It is going to be close...but Bottas just keeps himself ahead. Valtteri Bottas has some traffic ahead of him, he struggles to get the better of Carlos Sainz but finally manages it. However, he has lost a few valuable seconds. Lewis Hamilton is continuing to pound the circuit on those supersoft tyres he started the race on, 28 laps and counting. Hamilton's advantage over Sebastian Vettel is 15s. A supremely comfortable day for the Briton. Engineer to Sebastian Vettel: "OK Bottas is in traffic so it's good. Keep pushing, this is a crucial stage of the race." "Bottas needs to hit it now and try to get the maximum out of these tyres so Vettel doesn't take advantage and leapfrog him." With Sebastian Vettel gaining on Valtteri Bottas, the Williams is the first of the leaders to pit. He is back out in 11th after switching to softs, with Vettel elevated to second. Valtteri Bottas: "Guys, the tyres are dying." Engineer to Fernando Alonso: "OK Fernando, we have been given a warning about cutting the apex of Turn 16. The FIA have warned us so we have to be careful there." Sebastian Vettel's latest lap is half a second faster than Valtteri Bottas's. Meanwhile Carlos Sainz is under investigation for crossing the pit exit line and he gets a five second time penalty. Wow that gap is getting bigger and bigger at the front, with Lewis Hamilton now seven seconds ahead of Valtteri Bottas, whose attention will surely now be switching to Sebastian Vettel. The Ferrari is 1.6s down the road from the Williams. Sarah Elizabeth: Nico sounds so sad, he deserved to have a proper race. Sort out the reliability issues Mercedes and make it FAIR. Mike Lloyd: Nice to see the new style safety barriers still require gaffer tape to repair them. Did Kimi Raikkonen and Sebastian Vettel touch? If not, they were racing as close as you physically can without actually making contact. Ben Baker: This year's Russian Grand Prix has been more exciting in the first 20 laps than the whole of last year's race! Charli: Love Sainz! We need more drivers like him. Paul Simeons: Great racing from Daniel Ricciardo as usual! Max Verstappen, who is currently 12th: "The tyres are no good anymore." Meanwhile, Lewis Hamilton is going about working up his advantage at the front again after the latest safety car appearance. He leads Valtteri Bottas by 3.7s. How's Carlos Sainz getting on after his dramatic crash in practice yesterday? Very well is the answer, he is up to 11th and is involved in a thrilling tussle with Daniel Ricciardo in a battle for 10th, one that the Red Bull comes out on top of. "F1 is pretty incredible sometimes how tough it is. After a great start, leaidng the race and feeling confident. Straight after the safety car the pedal broke. It was quite dangerous. Definitely not a nice way to end the day. "The championship is more difficult of course but I am never going to win a championship like that when normal things break. "But I will come back, keep pushing, keep attacking and try to win in Texas." Tense racing between Sebastian Vettel and Kimi Raikkonen, the two battling wheel-to-wheel. Raikkonen runs wide at Turn 2 and Vettel is into third. The safety car comes in on this lap. Valtteri Bottas is a bit too eager to get the jump on Lewis Hamilton at the restart, coming close to running his Williams into the back of the Mercedes. He backs off. The safety car is still out as marshals continue to work on clearing up the debris where Romain Grosjean crashed, a bit of duct tape getting plastered over the damaged barrier. Dazzla: That shunt looks frightening when played in real time. Ian Scamans: Did Grosjean have a puncture or broken suspension? The car was looking low, leaning towards the right rear before he lost it. John Horne: Wow so much happening in this great Russian GP. Shame about Nico.Glad Grosjean is OK after crash. Plus two SCs. Engineer to Pastor Maldonado: "Pastor, confirming that Romain is absolutely fine. He walked away, no problem." Replays highlight just how big a crash that was, the Lotus flying into the barrier at high speed. Romain Grosjean was walking a little gingerly after he stepped out, a little winded perhaps, but otherwise OK.
Kimi Raikkonen is informed over team radio that they think Romain Grosjean went off as a result of going over the marbles - little bits of rubber from off the tyres - on the track. Fernando Alonso, Jenson Button and Robert Merhi are among the drivers to have pitted. "Grosjean starts to lose the rear of the car, it takes him onto the marbles and then he's on a one-way ticket to that barrier." Romain Grosjean climbs out of the damaged Lotus. Lewis Hamilton and Valtteri Bottas stay out, as do a couple of the others towards the front of the field, with several cars further down the pack heading into the pits. Romain Grosjean has crashed. The Lotus is into the barrier at Turn 3. He is moving in the car, which is good to see. Mercedes: Initial analysis; as far as we can tell, the throttle damper has failed on @nico_rosberg's car. Back to matters on the track and Lewis Hamilton holds a three-second lead over Valtteri Bottas. Dan Parkin: Gutted for Nico Rosberg after driving superbly all weekend. Slim hopes of the championship for him now definitely over. What must Nico Rosberg be thinking? He has had some rotten luck. All he can do now is watch on as his title hopes appear to evaporate. Lewis Hamilton is informed of Rosberg's plight: "Your team-mate has retired. Let's focus on this race." "You have to feel for Nico. He did everything so far this weekend and in the end he is left with his thoughts of what could have been." Nico Rosberg limps back to the pits and his Mercedes is switched off. He is out of the race. If Lewis Hamilton wins this, he will lead by 73 points, with just 100 to play for. "It looks like it's all over in terms of the world championship." Lewis Hamilton leads! Nico Rosberg is struggling with that throttle issue and runs wide at Turn 2, Hamilton pounces and moves to the front of the pack. Now Rosberg is passed by Valtteri Bottas. Big problems for Rosberg and a big blow to his championship hopes! Dan Smith: Imagine driving a Formula 1 car with a broken throttle, how is he meant to concentrate if he's worried about it sticking? Charli: Bottas is, without doubt, a future champion. A good battle develops between the two Ferraris as Sebastian Vettel looks to make a move on Kimi Raikkonen at Turn 2, the Finn defends his position though, and remains fourth. Seven laps in and Nico Rosberg leads from Lewis Hamilton, Valtteri Bottas and then Raikkonen. Nico Rosberg: "The throttle pedal is broken. If it sticks, what should I do?" Engineer: "Nico, it would kill on brake pressure." "Quite clearly the straight-line speed of the Williams on show, Bottas easily overtaking Raikkonen." Valtteri Bottas pounces immediately after the safety goes in, moving ahead of Kimi Raikkonen and into third. "Excellent Valtteri. Nice work," he is told over team radio. Safety car is coming in on this lap. Can Lewis Hamilton get one over Nico Rosberg here? Fernando Alonso was one of the big movers before the safety car came out. He is up to 14th from 19th, while Kimi Raikkonen is up to third from fifth. "Hamlton had a couple of opportunities, got himself alongside Rosberg and then backed out sensibly." Toro Roso's Max Verstappen: "I couldn't do anything about it, the car just came spinning to me. It's the left rear tyre that's damaged." Romain Grosjean comes in, an adjustment on the front flap on his Lotus, before heading back out. Max Verstappen also heads in after that contact with Nico Hulkenberg resulted in a puncture on his left rear tyre. The safety car comes out after contact between Nico Hulkenberg and Marcus Ericsson at the start. Replays show Hulkenberg spun at the first corner, tagged Max Verstappen's Toro Rosso and then Marcus Ericsson could not get out of the way quick enough. Anthea Lansborough: Come on Rosberg and Vettel. Just want this season to stay alive a bit longer! Alforsport: This Russian GP is shaping up to be a good one with so many uncertainties! Let's hope we get some place changes off the start line! Big day for Nico Rosberg and he looked very focused on the task at hand moments before the formation lap. Four drivers head off on the formation lap with soft tyres bolted on - Pastor Maldonado, Felipe Massa, Marcus Ericsson and Fernando Alonso. The rest of the field are on the supersoft tyres. London Photographer: Russian national anthem always reminds me of Sean Connery's 'The Hunt For Red October'. Amy: Definitely think they should wear bandanas at every race. "It feels special after the little celebrations over the weekend. It's a shame we don't have big possibilities but we have to try to be creative. I can get close to the points, I think." Just under 10 minutes to go until lights out. Is this Nico Rosberg's last chance to realistically keep himself in the title hunt? Simon Emms: Why doesn't David Coulthard just do the grid interviews in the lavatory? Seems that's where they're all heading. The Laird McDermott: Never stop a man on his way to the loo to interview him, David. A genuine look of concern appears on David Coulthard's face as he tells Toto Wolff that he looks calm, to which Wolff replies: "You have not felt how sweaty my hand is." “Don’t expect much variation in strategy. Despite their lack of experience from limited running in practice, the teams are saying this is a near-dead cert one-stop race. The long pit lane already pushes them that way, tyre degradation is very low and on life a one-stop is easy, with the super-soft predicted to go 25 laps and the soft 35. Jenson Button has just been speaking to David Coulthard again about their brilliant BBC F1 rallycross feature. Button said: "It was great fun, mate, so thank you for that opportunity. Now it's back to my day job. "[Starting 13th] is as good as we can do at the moment." Edward Williamson: Oh great. Another three years of Pirelli. Peter Hayes: So, if Bernie isn't having us on, Pirelli will be the supplier to F1 for three more years. Nico Hulkenberg catches DC's eye but he wants none of it, trying to get away but he's not quick enough! Twenty minutes until lights out and it is time for David Coulthard's to see who he can snare for a quick word. "Bernie said Pirelli have done a decent job but Bernie likes continuity." Pirelli signed up for three more years? "Bernie Ecclestone shakes Pirelli chairman's hand live on #BBCF1 and says "we've done a deal". He means the next tyre contract. I think"
The Sunday Telegraph carries an interview with Red Bull's Russian driver Daniil Kvyat as he prepares for his home race. Kvyat tells them that he likes to read the "classics, those life stories which can teach you something". He explained: "At the moment it's mainly Russian things, and a bit of Shakespeare as well. I always have something when I am travelling." Flann: What a feature with Jenson and DC! Grapevine Grand Prix: This rallycross feature is the best thing I’ve ever seen on TV. Jessica: Can't help but smile at the rallycross feature about @JensonButton and Papa Smurf. Such a great feature. You can watch that feature with Jenson Button and DC here.